“By creating opportunities that nurture talent and enable the socially disadvantaged to utilize their potential, and make a difference”, is what we believe. 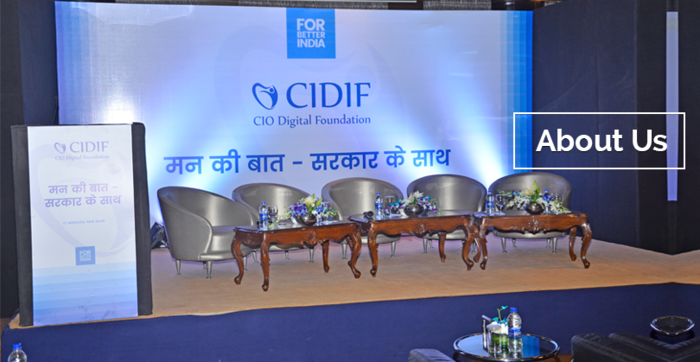 CIOs Digital Foundation is an enlisted Non-profit organization to partner together with government, IT organizations,industry, and IT experts to reinforce India’s technology foundation. CIDIF has been framed with the reason for ‘Identifying and delivering solutions that help address the employability challenge’ with the same vision, ‘Digital India’ of our Respected Prime Minister. We strive to fight issues like Information & Technology which we believe are the areas of greatest need and deserve our special attention. A creative idea conceptualised by a group of famous CIOs (Chief Information Officers) and industry pioneers to collaborate with Ministry of Communication & IT in contributing back to the country and fortifying India’s innovation establishment. The members involve 2500+ CIOs, Government bodies viz., NIELIT, DeitY, Ministry of Communication & IT, Veterans from a Range of organizations over different domains and functions, OEMs, SI’s, Corporate, Skill development bodies and Academia. We are also discussing with organisations like NeGD, CII, Nasscom, NSDC, TRAI, DOT to leverage upon their expertise and resources for this cause. We recognize the challenges that need to be addressed.The Great Indian Talent Conundrum is the result of large number of qualified but inappropriately skilled candidates getting added to the talent pool. The CIO Digital Foundation has been formed under section 25 of the Companies Act with the purpose of ‘identifying and delivering solutions that will help address the employability challenge’. We will collaborate with Government skill development bodies and Academia. The members at centre of excellenceare enthused to contribute their knowledge, experience and time to work with the talent pool and prepare them with the right talent to deliver results. The skillsets accessible with the body implies not only the technical skills but also other specialized skillsto make the talent pool more employable. Further, we’ve set up plans in a systematic order and are working towards accomplishing our planned objectives in anticipated time with a focus to surface as resonating backing to Digital India and small city ventures across the nation. CIDIF anticipates that it will be energetic about government of India and states governments to help in chalking out Information Technology guide per five-year plan and complete joint endeavours to screen the accomplishment of these projects across the country. And lastly, is the total commitment from CIDIF’s incredible provocative and viable group will guarantee that this vision is accomplished before time and we scale to more up to date statures in building a Digital India and adding to ‘Make in India’ campaign significant and impactful. Further we might want to scale up globally to give best of the bread asset everywhere throughout the world. Help us realize our dream of helping needy members of the society who need a little support and to show their calibre.